This is what apocalypse looks like to me. Look at these strong gusting winds sweeping across Nantucket as Hurricane Arthur passes by. Hurricane Arthur has now reached the US continent and swept through North Carolina and Massachusetts! This apocalyptical video of strong gusting winds was caught on July 4 2014 in Nantucket, Massachussetts! Get out of there guys! 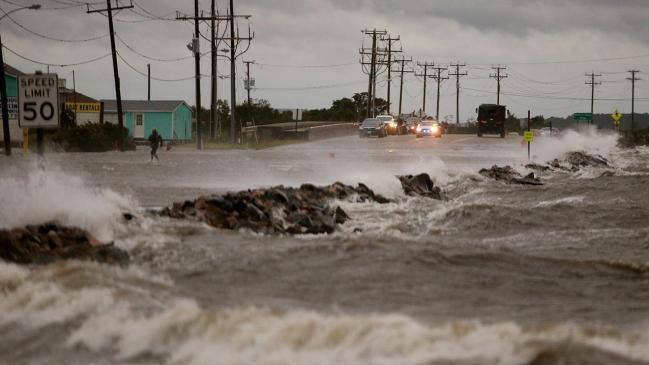 Streets flooded and big waves during Hurricane Arthur in the USA. Hurricane Arthur has weakened but its winds still represent a danger to the northeast of the United States. With winds of 130 km/h, Arthur progressed over the sea at 43 mph. It hit Nantucket, Massachusetts, yesterday night, with tropical storm force winds. But look at this video from Nantucket! Listen to the noise of the Arthur’s strong winds. It’s terrifying! Hurricane Arthur is the first Atlantic cyclone of the season and was scaled “category two” on the Saffir-Simpson scale (of maximum five). But now, Arthur power is decreasing and should end up in Nova Scotia, Canada, Saturday morning. Well I hope you are not spending your 4th of July holidays over there! Follow us on Twitter and Facebook and share this first haboob of the year to year friends. Thank you!